This 1955 Chevrolet Nomad Autorama Custom provides a look at what happens when a ’55 Nomad, a 1953 Corvette and 1994 Corvette ZR1 are blended together. Editor’s note: This is the 23rd in a 30-day series featuring cars from the Ron Pratte Collection that will be sold this month at Barrett-Jackson’s Scottsdale auction. This 1955 Chevrolet Nomad Autorama Custom provides a look at what happens when a ’55 Nomad, a 1953 Corvette and 1994 Corvette ZR1 are blended together by a master fabricator with an appreciation for GM Motorama history. 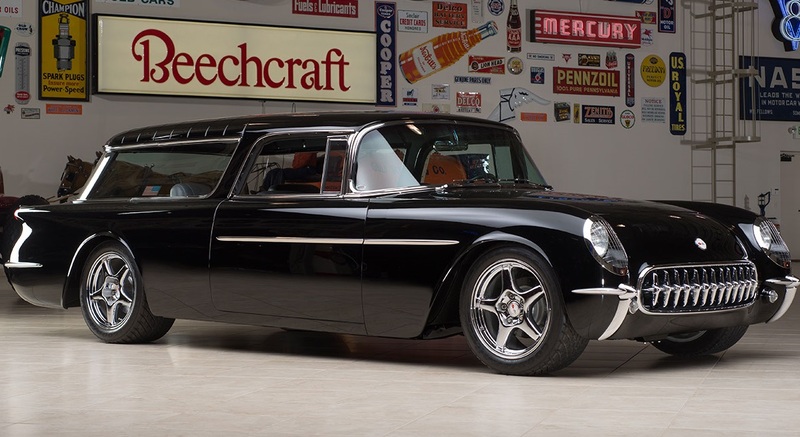 This fully streetable custom is based on a real 1955 V8 Nomad, but trades the vintage Nomad kingpin front suspension and live rear axle for updated C4 Corvette ZR1 components. Taking the ZR1 theme further, the original 285-cubic-inch small block V8 has been replaced with a fully polished 405-horsepower ZR1 engine backed by a ZF 6-speed manual transmission. The genuine steel Nomad body shell has been merged with a fiberglass 1953 Corvette nosepiece and quarter panels to capture the spirit of the Corvette Nomad show car of 1954. Inside, gray tweed and leather covers the four bucket seats, center console and vertical surfaces of the cargo area. Half Nomad, half Corvette, this sleek hybrid pays tribute to two of GM’s greatest styling triumphs. This 1955 Chevrolet Nomad Autorama Custom (Lot #2028) is scheduled to cross the auction block in Scottsdale on Tuesday, January 13. This nicely restored 1955 Chevrolet Nomad Station Wagon was built at the Van Nuys, California, assembly point and delivered new to Paramount Chevrolet in Paramount, California. Being a Nomad, it is unique in its own right, but this spectacular example is heavily optioned with the 265-cubic-inch PowerPac V8 with a Powerglide automatic transmission. Highlighting some of GM’s state of the art technological advances from the 1950s, this Nomad features a Wonder Bar radio and autronic eye headlights along with its deluxe electric windshield wipers and deluxe heater and defroster. It also carries a slew of powered options including power steering, power brakes, as well as power seats and windows. 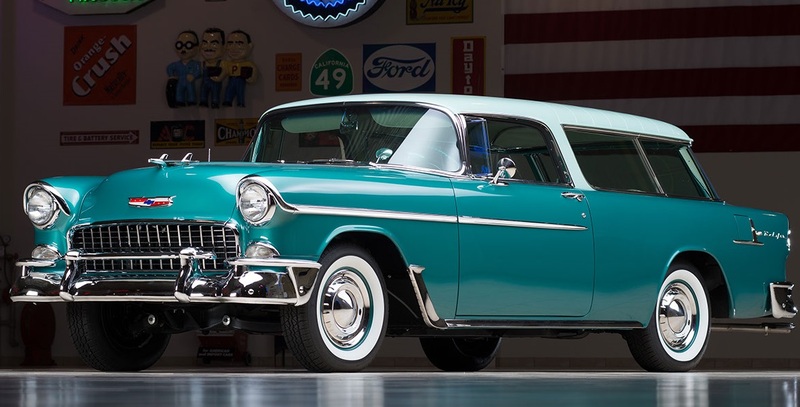 This 1955 Chevrolet Nomad (Lot #2050) is scheduled to cross the auction block in Scottsdale on Tuesday, January 13. 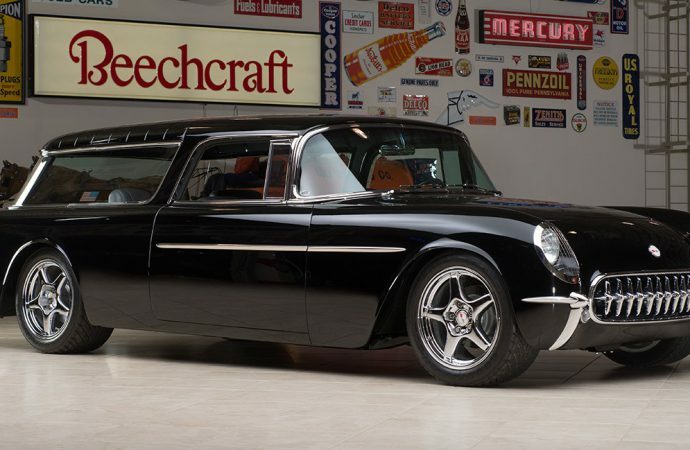 This meticulously built 1955 Chevrolet Nomad Custom Wagon has been restored with high-quality workmanship. It rides on an Art Morrison chassis with rack & pinion steering up front with adjustable coilover and a 4-bar rear with adjustable coilovers. The rear end is a 9-inch Ford with a 3.50 ratio. Wilwood disc brakes with drilled rotors have been added to all four corners. Under the hood, the engine is a chrome LS1 backed by a 4L60E overdrive transmission. Red leather, dual power bucket seats and a custom console grace the interior. This 1955 Chevrolet Nomad Custom Wagon (Lot #2040) is scheduled to cross the auction block in Scottsdale on Tuesday, January 13.